Be the first to share your favorite memory, photo or story of William C.. This memorial page is dedicated for family, friends and future generations to celebrate the life of their loved one. 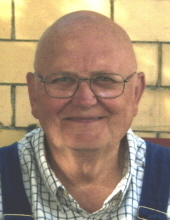 William C. “Bill” Reinhart, 76, of Fostoria, passed away at 3:04 am Wednesday morning March 27, 2019 at St. Catherine’s Manor, Fostoria. He was born May 25, 1942 in Fostoria to the late Harold C. and Margaret Mae (Kinn) Reinhart. He married Lola L. Reinhard September 29, 1962 at St. Wendelin Catholic Church, Fostoria and she survives in Fostoria. Also surviving are four children, Trina L. (Kevin) Sullenberger, Woodville, Rex A. (Cindy) Reinhart, Fostoria, Julie M. (the late Eric) Daniels, Risingsun and Ryan C. (Terri) Reinhart, Helena; 12 grandchildren; 17 great-grandchildren; two brothers, Gerald (Leona) Reinhart, Fostoria and Richard Reinhart, Findlay; and brother-in-law, Cliff Young, Fostoria. He was also preceded in death by a sister, Judy Young. Bill retired in 1996 from Autolite, Fostoria as a machine repairman after 36 years of service. He was also a longtime Wood County farmer. He was a member of St. Wendelin Catholic Church and a 1960 graduate of St. Wendelin High School. He also attended St. Mary’s Catholic Church, Millersville. He was a 3rd degree member of the Fostoria Knights of Columbus Council # 1197. Bill enjoyed and devoted his life to his family. His greatest joy was being surrounded by his loving wife, kids and multitudes of grandbabies and great-grandbabies. Visitation is Sunday March 31, 2019 from 2-5 pm at HOENING & SON FUNERAL HOME 133 W. Tiffin St., Fostoria. Funeral Mass is 10:30 am Monday April 1, 2019 at St. Wendelin Catholic Church with Rev. Todd Dominique presiding. Burial will follow in Perry Center Cemetery, Wood County. A luncheon will then take place at St. Wendelin Parish Hall. Memorials are suggested to St. Jude Children’s Hospital or St. Wendelin Church c/o the funeral home. To send flowers or a remembrance gift to the family of William C. "Bill" Reinhart, please visit our Tribute Store. "Email Address" would like to share the life celebration of William C. "Bill" Reinhart. Click on the "link" to go to share a favorite memory or leave a condolence message for the family.